The nonprofit sector depends on the power of volunteers who share of themselves for the greater good, and any tool that makes it easier to support and encourage volunteerism is a winner to me! We also know that often our very best volunteers become loyal donors. This intersection of volunteering and giving is where Sagepoint.com shines. Nancy Patterson (NP): How did the idea for Sagepoint begin? Vivian Wied (VW): Sagepoint was conceived to make life easier for busy parents, organizers, and groups of all kinds. At the time, I had three kids, a husband and two dogs to manage. I was struggling to keep track of everyone’s activities, the related items, tasks, and fundraisers I had volunteered to help with and keeping associated spending in check. Knowing other folks were experiencing similar challenges, combining easy-to-use online sign-up sheets, schedules, and invitations with an integrated calendar seemed like a great way to make life easier for a lot of people. Since every group we were involved with relied on fees, donations, and/or fundraisers to cover the costs of programs and activities, incorporating a fundraising component was an obvious way to help alleviate the financial challenges and fundraising burdens for everyone while also enabling us to offer the planning tools free of charge. NP: It makes sense to have the additional fundraising component. It looks like you started this product about 15 years ago. Is that correct? VW: It looks like I need to go update some of our online information. The software and information security consulting portion of Sagepoint Solutions is the part that originated 15 years ago. In fact our CTO holds one of the early internet security patents, and he’s applied his knowledge and experience to help insure the privacy and security of our users today. 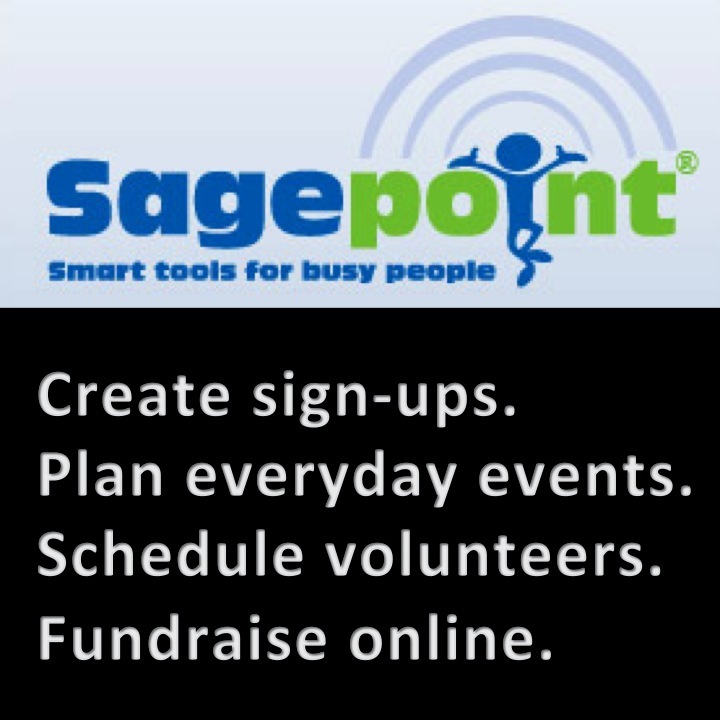 The first version of our community-oriented online organizer Sagepoint.com was launched in 2010 – after the sign-up sites you’ve previously written about. We’ve continued to add new features and functionality since the original launch and our Spiritad.com sponsorship fundraising features were just released recently. NP: Thanks for the clarification. So what are some of the most popular features of Sagepoint? VW: The most widely used services at this time are the event sign-up sheets. They’ve been used to organize everything from simple parties and potlucks to multi-day activities, meetings, care calendars, and events with separate sign-ups for volunteers, sponsors and participant registrations. Within individual sign-up sheets, popular features include the customizable automatic reminders, the customizable “Event Links” (url specific to the sign-up sheet that can be used on flyers and printed material) and the “Notes” fields which allows organizers to add details related to specific items and tasks and allows participants to add comments to their sign-ups or responses. While our original goal was to help parents, non-profit and community groups, we’ve also built up a loyal following of business users. These folks use Sagepoint to not only organize social events, but also to schedule clients, employee shifts and more. NP: Interesting. Tell us one thing about Sagepoint we may be surprised to know. VW: The new Spirit Ad fundraising features can be used to monetize just about any website. Groups can add the Spirit Ad banners to both their own websites and/or to Sagepoint pages they create. The system automatically updates the banners as sponsors sign up or change their info and are approved. This makes sponsor recognition and management extremely easy. The group generates much needed revenue, businesses benefit from the goodwill and exposure they receive as sponsors, and group members get the opportunity to save time and money in multiple areas. NP: Speaking of monetization, will you please explain your overall business model? VW: Our revenue is from businesses purchasing ad sponsorships. The model is similar to a candy bar or cookie dough fundraiser in that the group is selling an item and earns a portion of the proceeds as fundraising profit. In our case the group is selling a sponsored ad that they can display on their websites and/or Sagepoint pages. We provide all the tools needed to recruit, sign-up, manage and automatically display sponsor info online. It’s an easy way for any group to monetize its website(s) and/or recognize sponsors. All payments are processed online, and we send the groups their profits when their campaign ends or quarterly if they’re running an ongoing campaign. There is no required out of pocket payment from the group and like product fundraisers, the group receives a higher percentage of the proceeds as they reach higher tiers of sales. For nonprofits, community groups, and other content publishers, we offer control over ad content, control over pricing, choice of display options and access to non-traditional sponsors and goodwill advertisers. The current commission structure can be viewed by any user when they login to their free Sagepoint account, scroll down to the footer, and click on “Commissions.” Our range is extremely competitive, starting at 50% and ranging up to 90%. NP: If someone is interested in implementing a Sagepoint product, what advice do you have for them to get started? VW: Just go ahead and do it. All the planning features are free so there’s no risk whatsoever. There is no charge to setup and run a Spirit Ad campaign either. Just enjoy the revenue we send you. If you’re not sure how to implement something, click on “Examples” or “Help” at the bottom of any page. If you want to use one of the examples as a template, just click on “Copy Event” at the bottom of the page to copy it into your account. If you still have questions, send us an e-mail and we’ll be happy to answer your questions or help you find a solution. Learn more by visiting Sagepoint.com and their blog Sagepointers.com. We appreciate your great finds. Keep ’em coming. You are the best. Thank you again for taking the time to learn and share about us. Your thoughts and perspectives are always appreciated. Enjoyed learning more about your company Vivian, and please do keep us posted on your progress!